FKX116 - Qdup - Sonic Drop ft. Awoke Qdup returns to Fort Knox Recordings with a new single first imagined on the Playa at Burning Man. During his first trip to Black Rock City Qdup performed a special hip-hop showcase at Funky Town and invited MC’s to rock his set and bring the cypher to the desert. San Francisco b-girl and Hip-Hop aficionado Awoke was one of the MC’s that appeared out of the dust and blessed the mic that afternoon and caught the ears of the crowd, inspiring this collaboration. “Sonic Drop” captures the fun of that impromptu Hip-Hop jam in the desert. 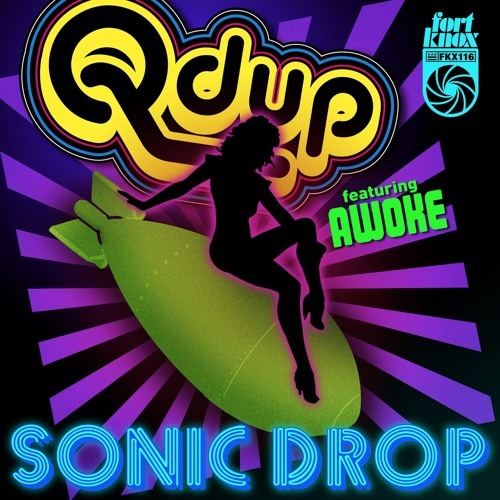 This tune pops and locks from start to finish, with an infectious vibe that invites the party to get down on the dancefloor like Awoke and Qdup did that day! The track is all about Awoke’s flow as she says “Feel it deep inside and when the DJ starts to vibe, I’ll be the first one in line, straight Salt-N-Pepa pushin’.” It’s time to push it real good, so get on the dancefloor and push it when the DJ drops this cut! Qdup’s tight beats, 808 boom and bass-laden production set the tone as Awoke’s concise party raps direct the dancefloor to drop it like it’s hot. Put this on as a sure-fire way to get booties moving and create a Sonic Drop on the dance floor.